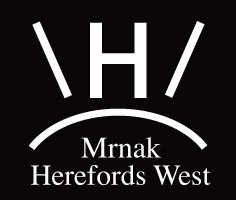 Mrnak Herefords West is family-owned cattle business with a focus on stout, sound females and an emphasis on production that can perform in any environment. The base of the herd originated in North Dakota and expanded with the purchase from Oregon. Our goal has always remained the same; raise sound functional cows with great udders, loads of milk and rib shape that turns grass into pounds. "Culling" is a strong management tool as we do not retain animals that are not efficient and do not reproduce. We market cattle off the ranch and at select sales in the West. Our cattle are favorites with the commercial cattlemen as well as those seeking purple banners in the show ring.